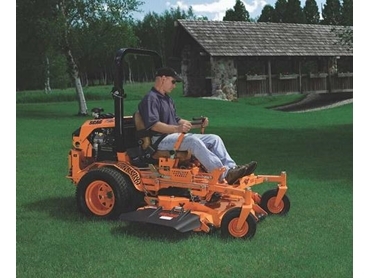 International Mowers offers a range of commercial mowers manufactured by Scag Power Equipment. Scag has been producing heavy-duty, commercial mowers for over 25 years. Based on feedback from their customers, the company constantly innovates and modifies their commercial mowers to improve performance as part of product evolution. Scag commercial mowers are fabricated at their parent company, Metalcraft of Mayville, Inc., a major independently owned manufacturer of commercial power equipment in North America. Metalcraft manufactures the Scag range using state-of-the-art laser cutting machines, punches, presses, brakes, robot, certified manual welders and highly-skilled employees to ensure that every mower is built to the highest standards. Scag Power Equipment is one of the very few commercial power equipment companies that actually manufactures their own components. Manufacturing their own components allows them greater flexibility in design and more control in the quality of the parts used in their mowers. The entire Scag team focuses all of its resources on designing, manufacturing and assembling one of the finest commercial lawn mowers money can buy. Scag’s commercial mowers come with advantages such as ease of service, wiring harness looms and routing, weld quality, component fit and construction as well as the operator's platform. Scag’s commercial mowers are sold through a worldwide distributor and dealer network. Every distributor of Scag equipment has an in-house parts department, technical service department and sales department to better serve the Scag dealer and the Scag customer.